You'll start seeing things differently. You probably know us best for our love of obsession with two things: yoga (duh) and music (maybe less obvious, but also… duh). We’re pretty psyched any time we get to share news or fun facts about either of these topics, but we’re actually way deeper than that! There are plenty of other things we love (ice cream, road trips, and puppies, to name a few) — and sometimes we stumble on something that might seem a little random (no yoga! no music!) but that we can’t wait to tell you about. Case in point? It’s come to our attention that color actually affects your mood. So cool, right? Allow us to explain. 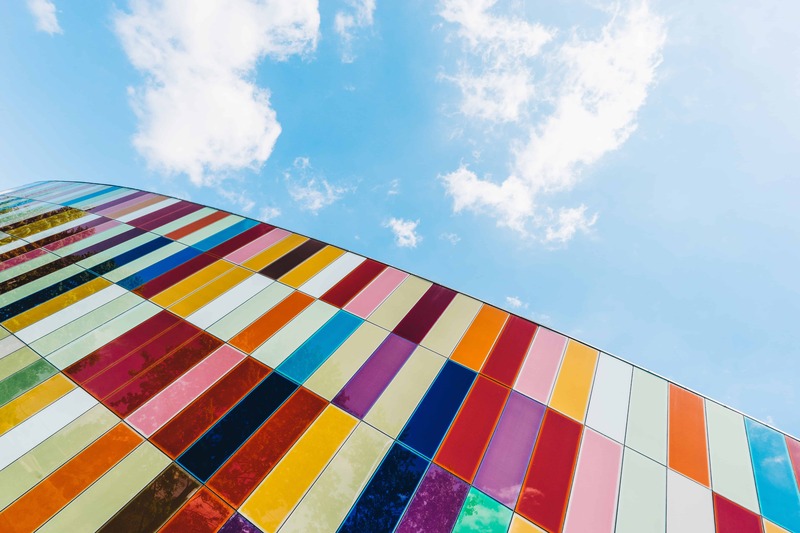 Each color can affect different people differently, so there’s no one size fits all, but research has confirmed that there are most definitely patterns in the way many of us experience specific tones. Keep scrolling for a few well-documented rules of thumb on color, which may help you better regulate mood and stress levels in your own colorful world. We’ll defer to Kermit on the matter of “being green,” but seeing green is actually very easy. Looking at the color green puts minimal strain on your eyes. Removing this kind of physical stress is a great way to feel more relaxed and tranquil! Per Science of People, research has proven that orange increases the oxygen supply to the brain, raises energy, and stimulates brain activity. As a result, it’s known as a color of enthusiasm and stimulation! This one’s kind of a no brainer (after all, when was the last time you looked out at a clear ocean and felt stressed?). Blue is stable, calming, and relaxing. Gray tends to zap people of energy, so while it can be the perfect paint color for your cozy bedroom, it might not be the right color to wear if you’re trying to keep people engaged in a lengthy presentation or going in for a job interview. According to research from more than 52,000 NHL games, teams who wore black jerseys were more often penalized for violence than those who wore other colors. Seeing black, as a result, is thought to inspire anger and aggression. At last… our signature color — and we love what it signifies! Red is the color of (what else?) passion! Passion for movement, passion for music, passion for bulldog yoga! Catch a glimpse of red if you want to get fired up. Do you find that color affects your mood? Tell us more on Facebook + Twitter!